ZK/U - Center for Art and Urbanistic’s residency programme is open for applications from artists, scholars and practitioners that concern themselves with the phenomenon of ‘the city’. 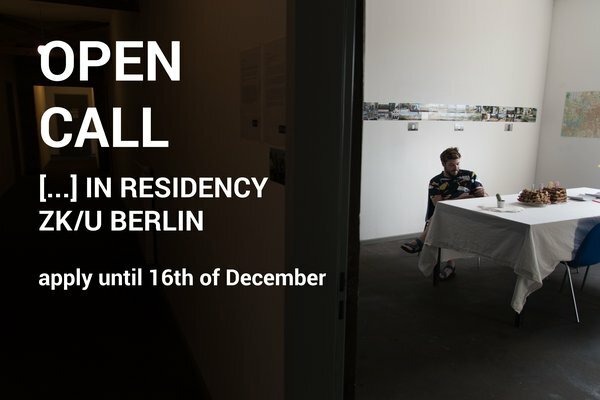 Proposals for a residency at ZK/U Berlin can be in the range of contemporary artistic positions that are conceptual, interventionist and contextual. The work at ZK/U is informed by theoretical and practice-based critiques within the fields of urban research, geography, anthropology, urbanism, architecture and the humanities. Residents are encouraged to involve themselves with ZK/U’s programme and to propose their own formats. Within the frame of this Open Call, ZK/U is particularly interested in initiatives that create spaces for encounter and exchange between citizens from diverse backgrounds; formats that question and reclaim urban infrastructure and public space for the commons; practices that make global complexities graspable in a local context; and projects that imagine forms of local belonging within post-migration societies. In the context of its research and residency programme, ZK/U offers a production space where artists, researchers and practitioners can meet and work on individual or collaborative projects and ideas. 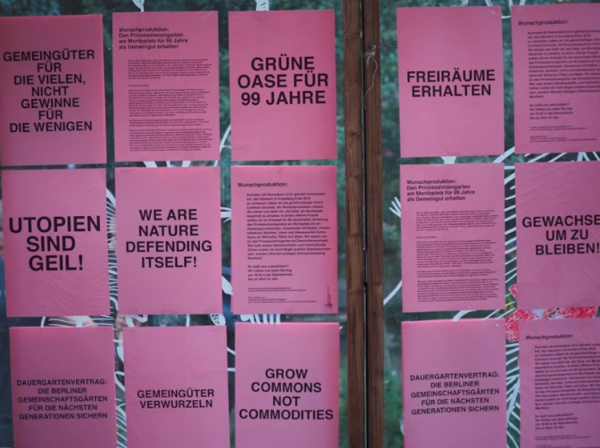 The programme consists of an active-collaborative format for mutual exchange, weekly work-in-progress presentations, communal dinners, a monthly public event with open studios, studio visits by professionals from ZK/U’s network, and an open platform for residents’ own projects. In the residency space there are furnished studio-apartments (half of which with private bathrooms) and communal facilities like a large kitchen, a terrace, a library-in-progress and a surrounding public park. For individual fellows or groups, depending on the type of studio-apartment and the length of stay (3-8 months), the residency costs are between €550 and €850 per month. The price covers all utility costs, space usage and participation in the residency programming. The residency period can take place anytime within the next two years after the selected resident is notified. 12.10., wir zeigen: "Halbes Hähnchen vom Himmel"
Während der Rest der Welt sich mit der Fußball amüsiert, kämpft Mevla W. um ihre Wohnung: drei Zimmer zu einem alten Mietvertrag in einem begehrten Berliner Innenstadtbezirk. Hier wohnt sie seit 1985. Warum sie sich in Zukunft mit zwei oder sogar nur einem Zimmer zufrieden geben sollte, sieht sie nicht ein. Sie hat ihre Ruhe, genießt ihr Leben zwischen Vasen aus der ehemaligen Tschechoslowakei und elaborierten Arrangements für Kletterpflanzen und hat aus ihrem Fenster alles Geschehen in ihrer Straße im Blick. Aber auch ihr Vermieter hat seine Interessen. Bewaffnet mit Greifarm und handgeschriebenen Briefen an sämtliche Berliner Gerichte wehrt sich Frau W. dagegen, mit ihren 74 Jahren ihr soziales Umfeld zu verlieren und in einen „Käfig“ ziehen zu müssen. Ein intimes Porträt einer starrköpfigen Frau über den Unterschied zwischen Rechtsprechung und Gerechtigkeit, über Rache und Genugtuung und über Anspruch und Wirklichkeit. While everyone else is watching soccer, 74 years old Mevla W. is fighting to keep her apartment. She lives in 3 rooms in a central neighborhood in Berlin. She has been living there since 1985, and she doesn’t see why she should accept to move to a 2 or even 1 room flat. She has her peace, enjoys life between stylish vases from former Czechoslovakia and elaborate flower arrangements, and when she looks out her window, she sees everything that’s going on in her street. But her landlord has his own interests. With her gripper arm and handwritten letters to all existing Berlin courthouses, Ms. W. tries all she can to avoid losing her environment and moving into a „cage“. Über vier Jahre hat kollektiv orangotango counter-cartographies – widerständige Kartierungen – aus der ganzen Welt zusammengetragen. Diese Sammlung zeigt, wie kritische Karten gemacht und genutzt werden – als Teil von politischen Kämpfen, kritischer Wissenschaft, Kunst und Bildungsarbeit: von indigenen Kämpfen um Land in Amazonien bis zu Wohnungskämpfen in San Francisco, von der Verteidigung der Gemeingüter in Mexiko bis zum Balloon-Mapping von Refugee Camps im Libanon, von politischer Basisarbeit in den Philippinen bis hin zur Sichtbarmachung von sexualisierter Gewalt in Kairo und kolonialen Spuren in München. Im Rahmen einer Ausstellung wird das Buchprojekt präsentiert. Kritische Kartograph*innen, Herausgeber*innen und Autor*innen von This Is Not an Atlas sind anwesend und teilen in Workshops und Podiumsdiskussionen ihre Erfahrungen aus verschiedensten Kartierungsprojekten. Die Veranstaltung wird größtenteils in englischer Sprache abgehalten. Gäste sind u.a. Philippe Rekacewicz, Denis Wood, Bureau d’Études, Erin McElroy (Anti-Eviction Map), Berlin besetzt, Mark Graham, Alarm Phone. Organisiert von Kollektiv orangotango und der Rosa-Luxemburg-Stiftung, unterstützt von Le Monde diplomatique, transcript und anstiftung. Over the past couple of years, the collective orangotango has gathered more than 40 counter-cartographies from all over the world. This Is Not an Atlas shows how maps are created and transformed as a part of political struggle, for critical research or in the context of art and education: from indigenous territories in the Amazon to the anti-eviction movement in San Francisco; from defending commons in Mexico to balloon-mapping refugee camps in Lebanon; from slums in Nairobi to squats in Berlin; from supporting communities in the Philippines to reporting sexual harassment in Cairo and visualizing colonial traces in Munich. 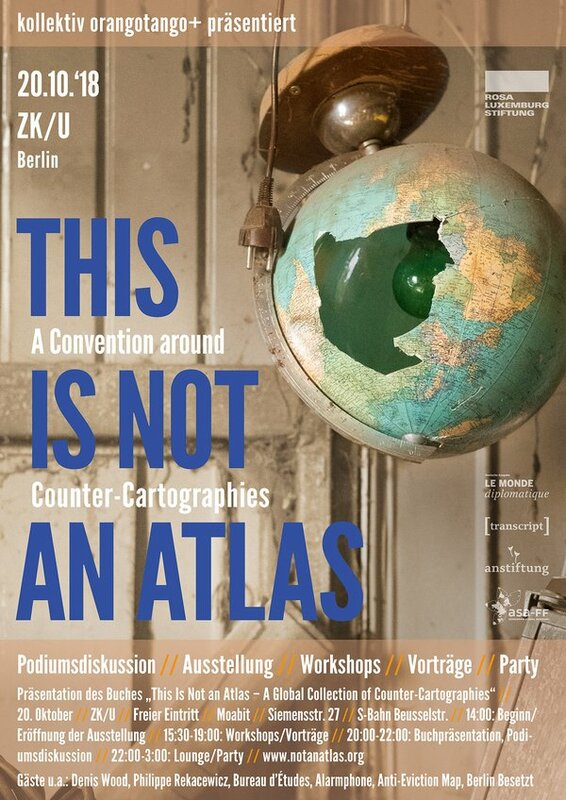 This collection will be presented in an exhibition, where counter-cartographers, editors and authors of This Is Not an Atlas will share their experiences in workshops and panel discussions. The event will be held mainly in English. Guests: Philippe Rekacewicz, Denis Wood, Bureau d’Études, Erin McElroy (Anti-Eviction Map), Berlin besetzt, Mark Graham, Alarm Phone, and others. Organized by the collective orangotango and Rosa-Luxemburg-Stiftung. Supported by Le Monde diplomatique, transcript and anstiftung. Das ZK/U soll ausgebaut werden! 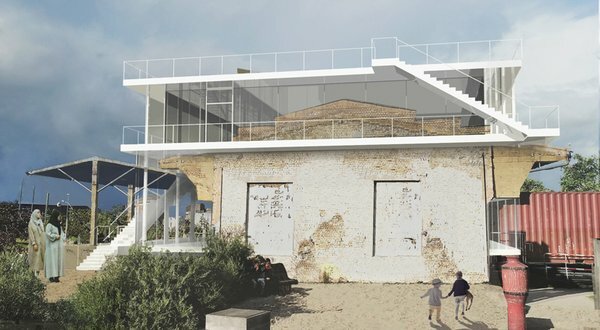 Eine neue Etage für Projekte, Bildung und eine "urbane Bühne" als weithin sichtbare und öffentlich begehbare Terrasse sollen Teil der energetischen Sanierung der Veranstaltungshalle werden. Wie können Initiativen und Nachbarn diese Räume nutzen? Welche Bedarfe gibt es? Welche innovativen energetischen und ökonomischen Konzepte passen zum ZK/U? In einer ersten Informations- und Workshop Veranstaltung möchte das ZK/U Nachbar*innen, Partner*innen und alle Interessierten einladen, mit uns zu wachsen. Wir laden daher am Sonntag, den 4.11. herzlich zum Frühstück von 10-11 Uhr und einem anschließenden Workshop mit allen Interessierten ein! The ZK/U will be extended! A new floor for projects, education and an ‘urban stage’ will create a greater visibility. The public hall will be energetically refurbished and a terasse will allow a new access and view from above. How can initiatives and neighbors use these spaces? What are their spatial and social needs? Which innovative energetic and economic concepts work for ZK/U? During a first round of workshops and knowledge exchange the ZK/U wants to invite all neighbors and partners interested in shaping the future of ZK/U. You are cordially invited to join us for an informal breakfast on sunday, 4th of November, in ZK/U from 10-11 o’clock, and a following workshop in the premises of ZK/U. 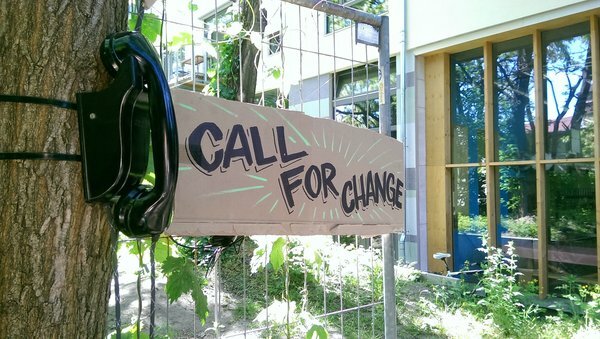 CTB Lab ist die Fortsetzung von citytoolbox.net, einer Lernplattform, die von Alumni des Programms Actors of Urban Change entwickelt wurde. Es ist an die lokale Besonderheiten jeder Stadt gekoppelt, wurde mit vorhandenen CTB-Plattform-Tools und entwickelt und geht dabei neue Kooperationen mit Kulturschaffenden, Behörden, Aktivist*innen und Wissenschaftler*innen aus dem lokalen Kontext ein. Das CTB Lab zielt darauf ab, Herausforderungen anzugehen, die durch die konventionelle Stadtverwaltung, Entwicklung oder Regenerierung entstanden sind. Zusammen mit der örtlichen Actors of Urban Change Community wird CTB ein CTB-Lab mit einer/m lokalen Akteur*in in Athen prototypisch entwickeln. In Zusammenarbeit mit Impact Hub Athen wurde Kypseli Market ausgewählt, um zwei etablierte Tools, Speisekino und Gütermarkt, zu implementieren und zu integrieren. Ziel ist es, die lokale Gemeinschaft in Kypseli durch die Einführung dieser Werkzeuge miteinander zu verbinden und zu stärken. Damit sollen neue Verbindungen zwischen dem bürgerschaftlichen Engagement und der weiteren Entwicklung des Marktes geschaffen werden. Speisekino // Food & Footage // Städtische Märkte als Transformationsraum // 05.10. SPEISEKINO ist ein gastro-kinematisches Format, das Independent-Filme und Kurzfilme mit Speisen zum Thema verbindet oder umgekehrt. Anlässlich des CTB-Lab werden wir eine Reihe von Kurzfilmen in Athen zeigen, die sich auf die sozialen, kulturellen und administrativen Funktionen der städtischen Märkte beziehen, als Paläste der Begegnung und des öffentlichen Lebens. Gütermarkt // Entwicklung Kypseli-Gütermarkt // 6.10. CTB Lab is the continuation of citytoolbox.net, a learning platform developed by alumnus of the program Actors of Urban Change. It addresses particular local challenges of any city with existing CTB-platform tools and - in the process - develops new ones in collaboration with cultural producers, authorities, activists and academics from the local context. CTB Lab aims at tackling challenges that have been left behind by conventional urban administration, development or regeneration. Together with the local Actors of Urban Change community, CTB will prototype a CTB-Lab with a local stakeholder in Athens. In a joint effort with Impact Hub Athens, Kypseli Market has been chosen to translate and integrate two established tools, Speisekino and Gütermarkt. The aim is to connect and empower the local community in Kypseli by implementing of the tools, and therewith shape new connections of citizen engagement in the further development of the market. Speisekino // Food & Footage // Municipal markets as transformational space // 05.10. Speisekino is a gastro-cinematic format, combining independent movies and short films with food related to the theme or vice versa. 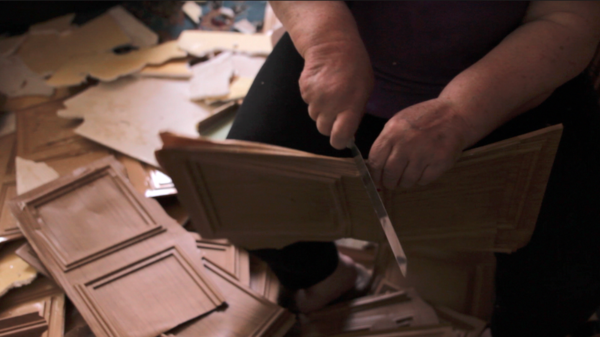 On the occasion CTB-Lab we will show in Athens a series of short films related to the social, cultural and administrative functions of the municipal markets, as palaces of encounter and true public life. Gütermarkt // Developing Kypseli-Gütermarkt // 06.10. 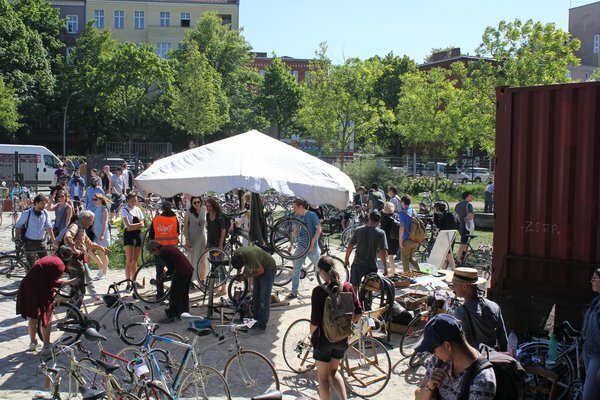 Gütermarkt is a hybrid-market and community meeting point that combines second-hand sale with local handcrafted items and repair-spots for bikes, electrical devices, clothes and even your hair. Five participants of the MitOst Festival will have the chance to meet local residents of the Kypseli Market in the tandem-like knowledge exchange and help CTB Team to make production plan for the first market in Athens scheduled for second part of October. Vom 24. August bis zum 08. September 2018 fand in Almaty, Kasachstan die Public Art Ausstellung WaterStreams, im Rahmen der neunten Ausgabe des ARTBAT Fest statt. In Partnerschaft mit dem europäischen Netzwerk Artecitya, wurden die Wasserströme des Essentai Flusses, seinen Kanälen (bekannt als Aryks), Flussufern und Fontänen durch Kunst im öffentlichen Raum thematisiert. WaterStreams präesntierte eine Reihe von internationalen Künstlern, Initiativen und ein Symposium, zu denen das ZKU mit Unterstützung des Goethe-Instituts Kasachstan die Künstler Ben Nathan und Matthew Charles Robinson (Baden Projekt, UK) im Art Bunker, einem ehemaligen Sovjet-Luftschutzbunker präsentierte. Die Künstler begaben sich dabei mit dem Projekt Glacial Waters auf eine filmische Reise entlang der Wasserströme: Beginnend bei der Gletscher-Bergkette von Zailiyskiy Alatau folgten sie den Strömen entlang von Wasserfällen, Reservoiren bis hin zu den Aryks in Almaty. 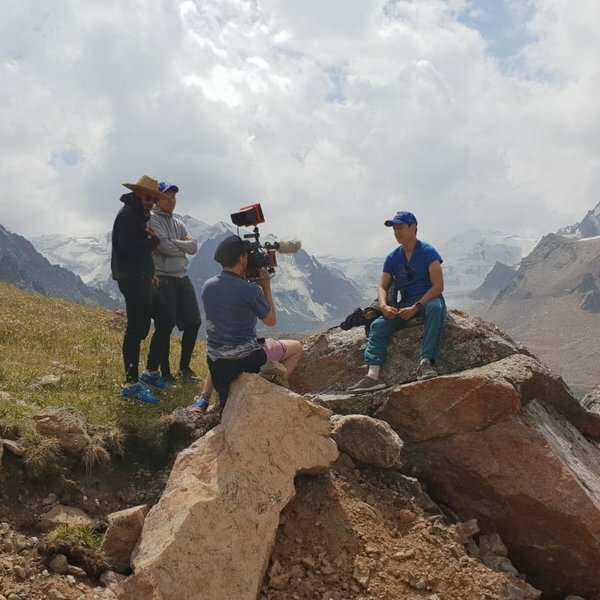 Dabei untersuchte das Künstlerduo, wie das Wasser das tägliche Leben der Menschen in Almaty beeinflusst und wies gleichzeitig auf die Gefährdung der Gletscher durch die Klimaerwärmung hin. Das Filmmaterial wurde als immersive Doku-Installation präsentiert, bei der holografische Projektionen auf experimentelle Soundaufnahmen trafen und den Besucher in die Welt der Gletscher und Wasserströme eintauchen ließ. Das künstlerische Programm wurde durch das Symposium What is Art without the City ergänzt. Spezialisten und Vertreter verschiedener Organisationen aus Europa und Kasachstan diskutierten über öffentlichen Raum und die Kollision mit Kunst, Design, Aktivismus, Technologie und Wissenschaft und suchten dabei neue Wege für seine Reaktivierung und Veränderung. Glacial Waters ist Teil des Artecitya-Projekts und wird vom Kreativ-Europa-Programm der Europäischen Union und dem Goethe-Institut Kasachstan kofinanziert. Almaty, Kazakhstan: The ninth edition of ARTBAT FEST was held in Almaty between 24th August and 8th September 2018 on the theme of WaterStream. In partnership with the European network Artecitya, WaterStream revived the Essentai River, channels (locally known as ´aryks´), riverbanks and several fountains. ARTBAT FEST 9 hosted an array of international artists, initiatives and a symposium. In this frame, ZKU Berlin – Center for Art and Urbanistics facilitated with the support of the Goethe-Institut Kasachstan the Glacial Water project. Following a research trip to Almaty, the artists Matthew Robinson and Ben Nathan (Baden Projekt) created an experimental documentary film installation, starting with the source of water from the glacial mountain range of Zailiyskiy Alatau, following its course into the city via impressive streams, waterfalls and reservoirs to the aryks of Almaty. On one hand, the artistic duo documents ways in which people use water in their everyday lifes, while on the other hand they explore consequences of global warming on the glacier. The work was displayed in a converted sovjet bunker as holographic multi-channel projections onto water and transparent screens, accompanied by electronic soundscapes from Eva Geist. Baden Projekt’s work explores the changing state of water, to provide alternative perspectives on nature and the city. One of the primary concerns of their work is to bridge the gap between film documentary and film installation, providing a means to immerse the audience within a constructed environment which provides a sensory experience. The work promotes the significance and the impact that water has on health and wellbeing. Glacial Waters is part of the Artecitya project and is co-funded by the Creative Europe Programme of the European Union and the Goethe-Institut Kasachstan. Die EXPERIMENTDAYS sind eine Plattform für gemeinwohlorientierte Projekte. Seit 2003 bietet die Netzwerkveranstaltung die Gelegenheit, Stadt weiterzudenken, sich über nicht-spekulative Wohn- und Bauformen zu informieren und Mitstreiter*innen und Unterstützer*innen dafür zu finden. In diesem Jahr laden die EXPERIMENTDAYS.18 unter dem Titel KIEZ. BODEN. GEMEINGUT. / COMMUNITY. LAND. TRUST. Berliner*innen und auswärtige Akteur*innen laden ein, sich kennenzulernen, auszutauschen sowie rund um die Themen Stadt und Wohnen zu mobilisieren. Bereits im September fand der Auftakt der EXPERIMENTDAYS.18 statt. Im Oktober folgt urbanize! Internationales Festival für urbane Erkundungen. Ideen und Ansätze aus den Veranstaltungsreihen werden im November von den EXPERIMENTDAYS.18 aufgegriffen und vertieft. Friedrichshain, Warschauer Brücke / Revaler Str. The EXPERIMENTDAYS are a platform for charitable projects. Since 2003, the network event offers the opportunity to think ahead of the city, to find out about non-speculative living and building styles and to find fellow combatants and supporters for it. This year, the EXPERIMENTDAYS.18 invite you under the title KIEZ. GROUND. COMMON. / COMMUNITY. COUNTRY. TRUST. Berliners and foreign actors invite you to get to know each other, to exchange ideas and to mobilize around the topics of city and living. Already in September the beginning of the EXPERIMENTDAYS.18 took place. In October, urbanize! International festival for urban explorations. Ideas and approaches from the series of events will be taken up and deepened by the EXPERIMENTDAYS.18 in November.